The Kumbabhishekam of Arulmigu Sri Ramanatha Swami Temple of Rameswaram took place in a grandeur manner on January 20th 2016. 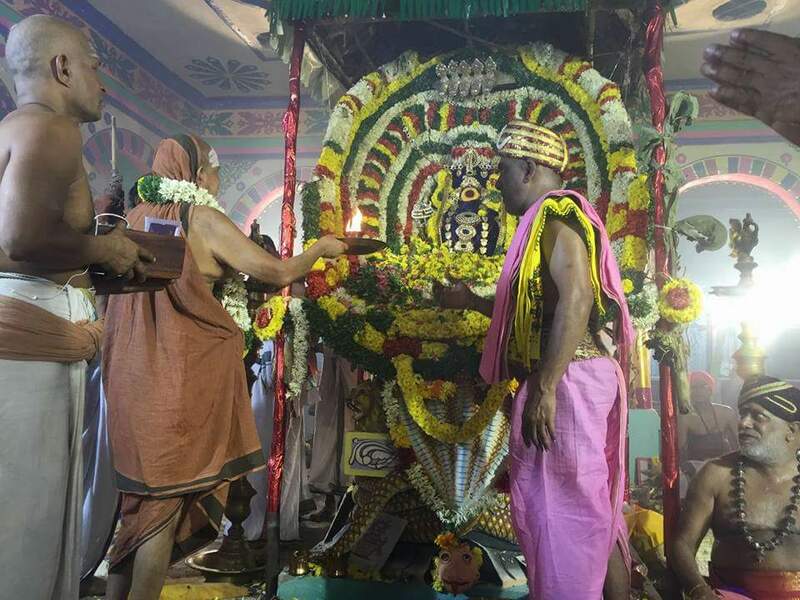 The presence of Sankaracharya of Kanchi Kamakoti Peetam – The 69th Pontiff – Sri Jayendra Saraswathi Swamigal made the event very special to all the devotees in Rameswaram and more particularly to the devotees of Sri Matam. A very special and historic significance of this Kshetram is that : The Sankaracharya of Kanchi Kamakoti Peetam and The King of Nepal have traditional rights to perform “Abhishekam” to the “Moolavar Ramanatha swami” directly other than temple priests. The 68th Pontiff of Kanchi Kamakoti Peetam – Jagadguru Sankaracharya Sri Chandrasekharendra Saraswathi Swamigal (Sri MahaPeriyava) commenced HIS Kasi yatra in 1929 from Rameswaram. 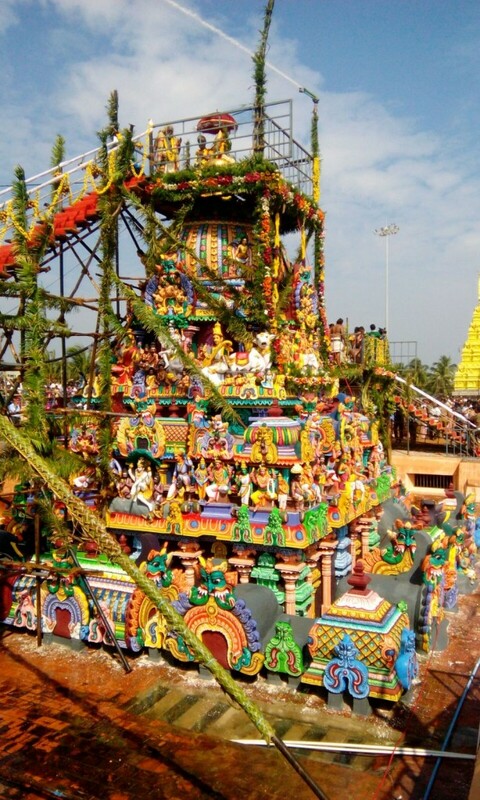 Here is a special video of Kumbabhishekam of Arulmigu Ramanatha Swami Temple – Rameswaram. We thank Thanthi TV for their special video of HH Sri Pudhu Periyava’s speech and the live coverage of the Kumbabhishekam. Note: The video below is updated after being posted originally on January 22nd 2016. History repeats itself, not once, not twice, but countless times. Continuing the tradition set by Jagadguru Srimad Adi Shankara Bhagavadpadacharya more than 2500 years ago, Kanchi Kamakoti Peetadhipathi Jagadguru Sri Sri Sri Jayendra Saraswathi Mahaswamigal participated in the Kumbabhishekam rituals of Sri Parvathavardhini Ambal sametha Srimad Ramanathaswami at Rameshwara Kshetram and performed Gangabhishekam and Mahapooja to Sri Ramanathaswami at the Sanctum Sanctorum with His Own Holy Hands. This video is clear evidence that affirms the established tradition and rights bequeathed to Kanchi Kamakoti Peetham, the only Peetam that has the singular distinction of having been adorned by Jagadguru Srimad Adi Shankara Bhagavadpadacharya, and adorned later on for ages by unparalleled titans of piety and penance, and in recent times the greatest Saint of our times, Sri Sri Mahaperiyava. Kudos to the entire team of Mahaperiyavapuranam and all others that worked towards capturing and publishing the above priceless video of one of the greatest events of present times. Good work done by the entire team of Mahaperiyavapuranam. Exemplary work of the team. They have brought things so beautifully and I felt that I am in Rameswaram. For devotees like me who could not go there, it was a bliss to see Periyava and we feel really blessed. All these are possible only by the Grace of Periyava. My ananthakoti namaskarams to the Lotus feet of Periyava. Kudos to the Mahaperiyavapuranam team for the excellent work. We are BLESSED to view the video–Three cheers to the entire team. Normally the man behind the camera has become the comentator. WELL established tradition cannot be wiped OFF by anybody.That happened on the day of KUMBHABISEGAM. It is glory and paradise regained. Thanks for this timely and authentic video. Hara Hara Shankara, Jaya Jaya Shankara! Shri Gurubhyo Namaha! Hara Hara Sankara Jaya Jaya Sankara. The present Acharya of Kanchi Mutt has done a great deed by establishing the right of Kanchi Mutt. Our sincere thanks to Sivaramji and his Team for this astounding video compilation of the Rameswaram Vijaya Yatra events of His Holiness Jagadguru Sri Sankaracharya Swamigal of Sri Kanchi Kamakoti Peeetam ..
Jaya Jaya Sankara , Hara Hara Sankara!! Wonderful moment .our great acharya sri.jayendra saraswati periiava made it inspite of his indifferent health and upheld the legacy of our great kamakoti peetam and our mahaswami.our deep felt gratitude to the team and sri.sivaraman in particular.Namaskarams. Ramaswamy. Murugalayam. Tiruvallur.